Sophie Turner and Joe Jonas are enjoying a relaxing holiday at a $45,000-a-night private island in the Maldives. Sophie Turner and Joe Jonas are holidaying at a $45,000-a-night private island. The couple confirmed their engagement in October 2017 and are now treating themselves on the ultra-exclusive Coco Prive land mass in the Maldives, which is a popular choice with Hollywood stars and celebrities. 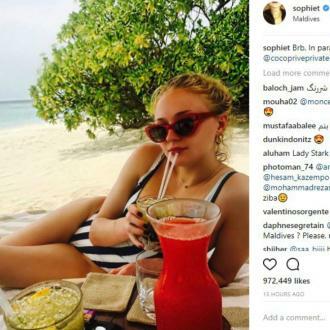 Sophie took to Instagram to post a picture of herself relaxing in ''paradise'' while lying on the beach in a nautical swimsuit and sipping from a cocktail. The 21-year-old star also posted another picture of herself perched on a jetty at Coco Prive with the sun blazing in the background. Coco Prive, a 1.4-hectare private island, boasts a master residence, as well as five additional villas, a dining room, cocktail bar, wine cellar, and indoor and outdoor gyms. Guests looking forward to cooling off in the water will also be pleased to note there is a 40-metre pool, one of the largest private pools in the Maldives. Sophie has recently been shooting scenes for the final series of 'Game of Thrones', and should she have needed a relaxing massage a spa therapist is on hand at Coco Prive any time day and night to tend to guests' needs, as is a private chef. Following the pair's engagement announcement, Sophie's pal Hailee Steinfeld recently admitted she helped to encourage their romance when it was in the early stages. She said: ''So Joe just got engaged to my really good friend Sophie Turner and I'm freaking out about it.